SpineFEST is a multidisciplinary academic day open to all faculty and trainees with interest in spine translational and fundamental spine research. Accreditation: This event is an accredited group learning activity as defined by the Maintenance of Certification Program of The Royal College of Physicians & Surgeons of Canada (section I, 6.5 points). Tator-Hall Visiting Professor Lecturer (Keynote Speaker): Sanford E. Emery MD, MBA , Professor and Chairman, Department of Orthopaedics, Director of Surgical Services, West Virginia University. SpineFEST is an accredited group learning activity as defined by the Maintenance of Certification Program of The Royal College of Physicians & Surgeons of Canada (section I, 6.5 points). All faculty and trainees with interest in spine care and research are invited and welcomed to participate in this event. Onsite free registration, however early RSVP to uoft.spine@utoronto.ca is encouraged. Location: MaRS Building, Main AuditoriumThe University of Toronto Spine Program’s 9th Annual Academic Day “SpineFEST” is being held this year on Monday June 12 at MaRS Centre, Main Auditorium- Lower Concourse. SpineFEST is a unique interactive platform bringing together the spine community across the university and its affiliated hospitals/research institutes. The program provides attendees with an in-depth review of current trends and innovations to managing spinal care and discusses updates on spine research spanning the spectrum from bench, to bedside to community. This year, our world renowned keynote speaker and Tator-Hall Visiting Professor Lecturer Dr. Zoher Ghogawala will be featuring “The Search for Truth in Spinal Surgery” at 8:00. Dr Ghogawala is the Chair of Neurosurgery at Lahey Hospital and Medical Center and a Professor of Neurosurgery at Tufts University School of Medicine. He is active in the surgical treatment of patients with disorders of the spine, carotid vascular disease and pituitary brain tumors. His research focuses on comparative effectiveness, cost-effectiveness, and neurosurgical outcomes, exploring the effectiveness, benefits and sometimes harmful results of different treatment options. The Day will continue with interesting talks from spine faculty members (Drs. Jefferson Wilson, Michael Fehlings, Raja Rampersaud, Julio Furlan, Carlo Ammendolia, Joel Finkelstein, and Henry Ahn) and trainees (Drs. Allan Martin and Eric Crawford) . In session I at 9:30 we will be discussing value-based spine surgery and spine quality, session II at 13:00 will focus on clinical trials/outcome measures in spine surgery, and in session III at 14:30 our PGY4 trainees from orthopaedic surgery and neurosurgery will provide their research presentations. We have received 30 excellent abstracts of clinical and preclinical research this year which have been reviewed by our faculty members. Winners of best abstracts will be providing oral presentation in session III. Abstracts will be presented at the E-poster presentations and viewing at 10:45. Winners of best e-poster presentation will be announced at the end of the day during the awards presentation at 15:40. All faculty and trainees with interest in spine care and research are invited and welcomed to participate in this event. Onsite free registration, however early RSVP to uoft.spine@utoronto.ca is encouraged. 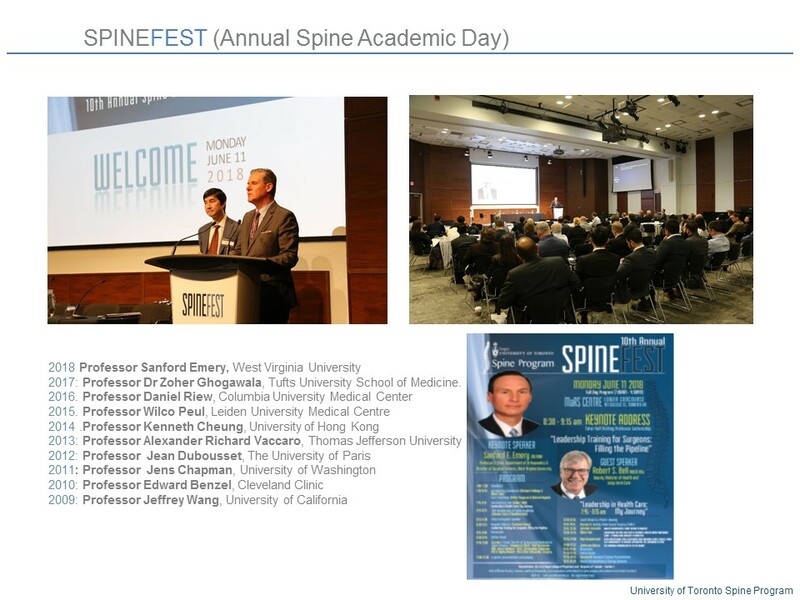 On June13, 2016 the University of Toronto (U of T) Department of Surgery Spine Program celebrated its 8th annual SpineFEST™ meeting at MaRS buidling. SpineFEST™ is the key annual academic meeting for the U of T Spine Program. Bringing together clinicians and scientists around the city’s university affiliated hospitals, this event aims to foster collaboration within the spine community locally and also serves as a venue to disseminate our activities to invited professors nationally and internationally. Co-led by Dr Michael Fehlings (University Health Network-Toronto Western Hospital/ UHN-TWH) and Dr Albert Yee (Sunnybrook Health Sciences Centre/SBHC), we held thematic sessions on cervical myelopathy and cervical deformity, also on controversies and complexities in cervical spine diagnosis including related management. We enjoyed research presentations by many of our city-wide spine trainees. Moderated by Dr Fehlings, our keynote Tator-Hall Visiting Professorship Lecture was presented by Professor Daniel Riew, Professor of Orthopaedic Surgery, Co-Chief of Spine Division, and Director of Cervical Spine Surgery at Columbia Medical Center. Dr Riew provided a dynamic talk titled “The Post-operative Patient with Persistent or Recurrent Symptoms”. He outlined some of the most common etiologies for failure of surgery including pseudarthrosis, inadequate decompression, poorly placed instrumentation, wrong-level surgery and non-cervical etiology. Dr Riew reviewed accurate methods to avoid this failure and outlined approaches to revision surgery. Our keynote speaker also led important discussions on how to communicate poor outcomes to patients after surgery. Moderated by Dr Eric Massicotte (UHN-TWH), the morning session on cervical myelopathy and cervical deformity presented the latest updates from our speakers on the topic field. Dr Mohammed Shamji (UHN-TWH) discussed the impact on cervical deformity and myelopathy while Dr Fehlings engaged us in an important dialogue about “what’s new & hot” in optimizing surgical outcomes for degenerative cervical myelopathy. Dr Stephen Lewis (UHN-TWH & Hospital for Sick Children/HSC) provided an overview on the evaluation and management of cervical deformity, followed by a review of novel assessment techniques defining degenerative cervical myelopathy provided by Dr Sukhvinder Kalsi-Ryan’s (UHN-TWH). The day continued with excellent presentations and discussions moderated by Dr Howard Ginsberg (St Michael’s Hospital/SMH) on controversies and complexities in cervical spine diagnosis and management. Dr Henry Ahn (SMH) led off the session focusing on the role and timing of surgery for traumatic central cord syndrome. Dr Yee (SHSC) provided an evidence-based update on spine clearance in the trauma patient as well as process improvement initiatives from a Level I trauma centre perspective. Dr Michael Angel shared his experience as a neurologist as he spoke about pearls and pitfalls of cervical myelopathy diagnosis. Lindsay Tetreault (PhD, Postdoc, UHN-Krembil Research Institute/KRI) concluded the session with an interesting talk reviewing the current state of the literature and outlining important knowledge gaps in degenerative cervical myelopathy. In the academic session, our spine scientist surgeon trainees updated us on their work. Christopher Witiw (MD, PGY5 Neurosurgery) presented the rationale for surgical intervention and reviewed a health economic and patient-centered analysis on the value of surgery for degenerative cervical myelopathy while Robert Ravinsky (MD, PGY5 Orthopaedic Surgery) talked about spine surgery fellowship education and the competence-based training education syllabus in Canada and beyond. This year, we received around 40 abstract submissions spanning clinical and pre-clinical spine research. Winners of 1st place abstract, 2nd place abstract, and 3rd place abstract provided oral presentations on their research findings. In first place clinical research abstract Alex Laliberte (PhD candidate -Institute of Medical Sciences/IMS) presented his work titled Hypoxia-Related MicroRNAs are Biomarkers of Degenerative Cervical Myelopathy Severity. In first place basic science research abstract Spyridon Karadimas (MD, PhD candidate, UHN-KRI) talked about the Riluzole blocks perioperative ischemia-reperfusion injury and enhances postdecompression outcomes in cervical spondylotic myelopathy. In 2nd place clinical research abstract Daipayan Guha (MD, PGY4 Neurosurgery) presented his work titled Accuracy Validation in the Cervical Spine of a Novel, Rapid, Optical Intraoperative Spinal Navigation System: Initial Clinical Feasibility. In 2nd place basic science research abstract Pía Vidal (PhD, Postdoc, UHN-KRI) talked updated us about her work on early decompression attenuates Ischemia-Reperfusion-Injury mediated inflammation for Cervical Degenerative Myelopathy (DCM). In 3rd place clinical research abstract Allan Martin (MD, BASc (EngSci), PGY4 Neurosurgery) presented his research titled Next-Generation MRI Identifies Tract-Specific Injury and Predicts Focal Neurological Deficits in Degenerative Cervical Myelopathy. Finally, in 3rd place basic science research abstract Stewart McLachlin (PhD, Postdoc, Sunnybrook Research Institute/ SRI) presented his work titled Virtual framework to evaluate osseous fixation pathways in the spine. SpineFEST™ continued on green and ecofriendly session with 24 e-poster presentations. First Prize e-Poster Presentation was awarded to Laureen Hachem (MD Candidate, UHN-KRI) for her presentation entitled Glutamate increases in vitro survival and proliferation and attenuates oxidative stress-induced cell death in adult spinal cord-derived neural stem/progenitor cells via non-NMDA ionotropic glutamate receptors, and the Second Prize went to Ayelet Atkins (Postdoc, SRI) and Mikhail Burke (PhD candidate SRI) for their work titled Characterization of microdamege accumulation in metastatically- invoved vertebra. SpineFEST™ ended with an enjoyable evening with the U of T-GTA Spine Rounds chaired by Dr Joel Finkelstein (SHSC) at the Park Hyatt Roof Salon. Dr Daniel Riew provided a talk arguing whether we are overspecialized in spine care. The evening continued with celebration of our city-wide spine fellows graduation. Our Program Co-Directors Drs Fehlings and Yee congratulated our fellows on the completion of their 2015/16 fellowship year and presented their U of T Spine Program fellowship certificates and plaques. The U of T Spine Program congratulated our citywide spine fellows (Drs Mohammad Zarrabian, So Kato, Safraz Mohammed, Markian Pahuta, Mark Kotter, Kevin Koo, Amit Keren, Kachinga Sichizya, Michael Dodds, and David Bellut) on a successful completion of their fellowship. On behalf of our citywide spine surgeons (Drs Michael Fehlings, Eric Massicotte, Raj Rampersaud, Mo Shamji, Stephen Lewis, Reinhard Zeller, Albert Yee, Joel Finkelstien, Michael Ford, Howard Ginsberg, and Henry Ahn) we extend best wishes to all fellows in their career and future endeavors. The U of T Spine Program would like to thank our participants for contributing towards the ongoing success of SpineFEST. We extend our appreciation to Professor Charles Tator, Professor Hamilton Hall, Professor Andres Lozano, Professor Peter Ferguson, and Professor James Rutka for their strong support of SpineFEST™ and the U of T Department of Surgery Spine Program over many years. The Program also extends gratitude to our educational event sponsors Medtronic, DePuy Synthes & Ethicon, Zimmer Biomet, and Stryker.